From left: Shirley Dennis, Lou Nave, Cannon County Farm Bureau Women with County Outstanding Agriculture in the Classroom Teacher Sebrena Wade, Sara Steelman and Donnell Ford. The Tennessee Agriculture in the Classroom Foundation each year sponsors an Outstanding Teacher Award program to recognize outstanding teachers from across the state. This program seeks to honor a select group of teachers who emphasize agricultural concepts across the various areas of classroom study. Designed to focus attention on the critical role of teaching, the program honors teachers for their outstanding contribution to education. County nominees compete for national honors including a scholarship to the National Agriculture in the Classroom conference. 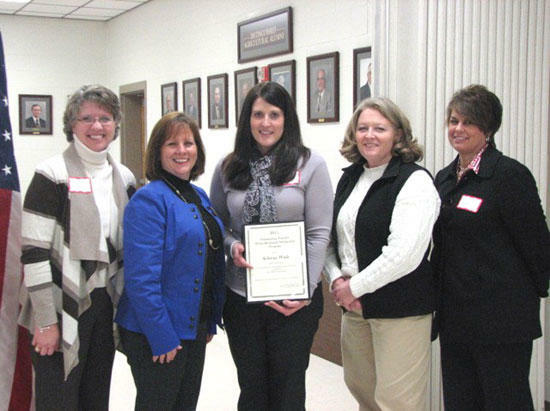 The Cannon County Farm Bureau Women’s Leadership Committee submitted Sebrena Wade, third grade teacher at Woodbury Grammar School, as Cannon County’s 2011 nominee. Ms. Wade incorporates agricultural concepts into her classroom in a variety of ways to allow her students to learn more about agriculture and the important role agriculture plays in our daily lives. Ms. Wade was recognized at the District Farm Bureau Women’s meeting in Cookeville.